Jalapeno peppers are great. The plants are easy to care for, the fruit have just the right amount of heat to use in all sorts of dishes, and the plants set a lot of peppers at once. It’s cool when you can step out to your front porch and pick a big batch of Jalapenos just from three little pots(Not to mention tons from the big rows of Jalapeno peppers in your garden). But then you get inside, you remember you already have a kitchen basket full of red ripe Jalapenos(You can pick them when they are big and green or red and fully ripe, we pick a mix) so what do you do? you just had salsa and tortillas yesterday, and hot chili the day before that. Everyone’s a little burned out on Jalapenos, but you don’t want those beautiful cones of hotness to go bad, do you? What can you do to save them? You could cut them in half and put them on a baking sheet in the oven on low to dry them out to use another time, but a easy and flavorful way to use extra hot peppers is to pickle them. use the recipe below and you will have yummy hot pickled peppers ready to use as a sandwich topping or in other recipes! 1 cup organic apple cider vinegar. 1 tablespoon pure cane sugar. 12 Jalapenos cut in half or slices, You can use green or red Jalapenos. You will also need a glass jar with a lid, a caning jar will work fine. And a metal spoon to help keep the jar from breaking when you add the hot pickling liquid. in a medium sauce pot on medium high heat, add the water, apple cider vinegar, salt, and sugar. Bring the mix to a boil. Slowly pour the pickling liquid into the jar, stop pouring when the liquid is about 1″ from the top of the jar. Let the pickle cool for 10 minutes and remove the spoon before adding the lid, let cool for another 50 minutes before putting in the refrigerator. Leave the pickles in the refrigerator for 24 hours before using for best results. 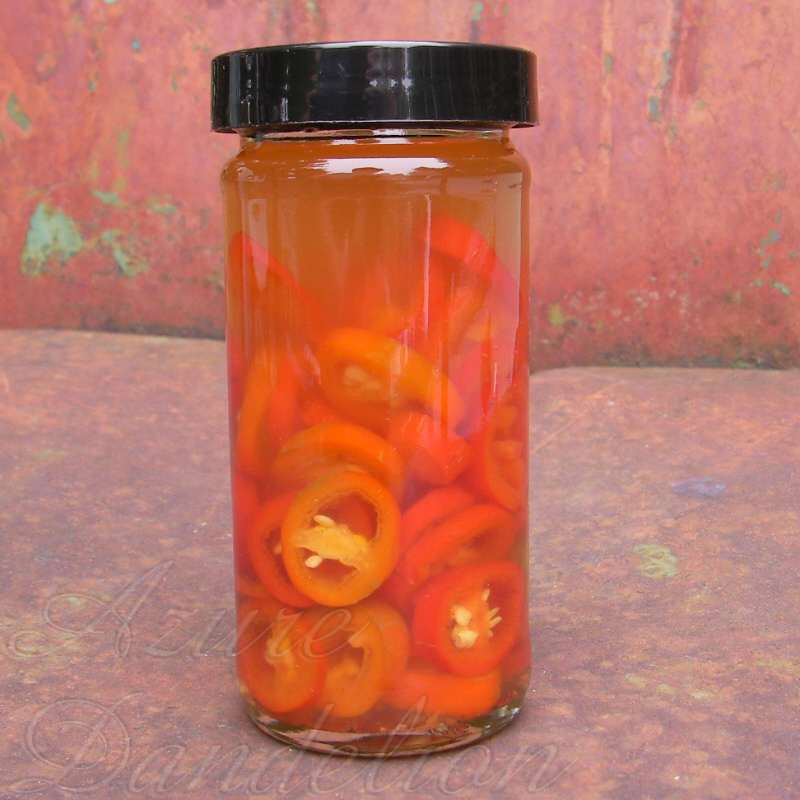 You can make a bigger or smaller batch of pickling liquid depending on how many peppers you have or how big the jar you use is. The pickles will keep up to a month in the fridge(If you don’t eat them all before then). Grow your own jalapeno peppers with seeds from Azure Dandelion!